L'Artisan Parfumeur, like Serge Lutens, is a Paris-based niche fragrance house, and I would guess that if you were to rank niche perfume brands by the status accorded to them at the various online fragrance blogs and forums, Serge Lutens would easily take the top spot and L'Artisan would comfortably take the second (do comment if you think my estimation is way off base). As with the classic perfumes of the first half of the 20th century, the Serge Lutens scents unfold slowly over the course of hours, and it is this complexity, I think, that allows for the intense, dream-like quality of the line. Yet the fragrances do not feel in the least old-fashioned, partly because of the unusual and exotic combinations of notes, but also because they simply smell outside of the whole canon of western perfumery. It is rare to hear someone compare a Serge Lutens fragrance to another scent (unless it is another from Serge Lutens), as is so commonly done with other fragrances on the market. L'Artisan's approach is something altogether different. I would not characterize the brand's aesthetic as "satisfyingly rich and complex", if anything, the line smells modern precisely because it has discarded conventional ideas about structure and composition. L'Artisan tends towards transparency and light, and even the denser, heavier fragrances, like Voleur de Roses, seem like explorations of relatively simple ideas. I sometimes think of the line as a catalog of "little smells". If that sounds like a criticism, it is not meant as one in the least, it is a style that I happen to like, and L'Artisan is one of my favorite houses. L'Artisan, like Serge Lutens, often uses unusual and exotic combinations of notes, but smell Bois Farine next to Chypre Rouge: it is just not the same approach to exoticism. And of course, the L'Artisan line doesn't present a unified kind of exoticism anyway, not being the outgrowth of the ideas of one man. But these aren't fragrances without stories. Passage d'Enfer illustrates beautifully that even a very simple fragrance can be extraordinarily evocative of place and time. Both lines are firmly niche, at least to my mind. Neither specializes in blockbusters. The fragrances don't smell generic or like they've been through a series of focus groups (although perhaps they have, I wouldn't know), and they don't always bow to conventional gender distinctions, or even to conventional ideas about what "unisex" should smell like. This is what makes them stand apart from the mainstream, and is what I think of as the hallmark of niche perfumery. L'Artisan Drôle de Rose is admittedly somewhat of an afterthought to all of the above, being no more representative of the L'Artisan line than any of the others. It was created by perfumer Olivia Giacobetti in 1996, and has notes of rose, aniseed, orange blossom, white iris, violet, almond, honey, rose powder, and leather. Drôle de Rose is often compared to Frederic Malle's Lipstick Rose (2000), and the two share an attitude along with prominent notes of rose and violet. That attitude is rather hard to describe, but both scents combine a modern, overtly synthetic feel with an almost tongue in cheek, vintage uber-femininity: picture a woman with lots of hair piled up high on her head, wearing a negligee, and sitting at her dressing table holding a large powder puff. Now picture Olivia Giacobetti interpreting that woman into scent, and you have Drôle de Rose. It is a rose fragrance to be sure, but it has nothing whatsoever to do with Serge Lutens' Sa Majesté la Rose. The result is something like fruity rose jam decorated with candied violets, heavily powdered, but very soft and light and billowy. The anise is very mild, likewise the almond and leather. There are times when I wear it and it just about makes me laugh out loud. There are other times when I wear it and it just seems conventionally pretty and rather dull, and then I know I might as well wash it off: when it doesn't work, it doesn't work. “There are other times when I wear it and it just seems conventionally pretty and rather dull.” That is how I feel about Drole de Rose all the time. It seems like a cheap and thin interpretation of the classical rose theme. Yes, you might guess that it is not my favourite L'Artisan. However, I enjoyed reading your description of its character in the penultimate paragraph. I have not had the pleasure to try one of l'artisan's fragrances yet, as they are near-impossible to get here in Argentina. I am tempted though to buy Figuier unsiffed for my BF, cause he LOVES figs and in some sites it is listed as unisex. I agree with all the descriptions of classic and niche fragrance rankings… it depends on personal tastes, I love Guerlain but my all time faves are Dior, YSL,Chanel and some Rochas (Eau de Rochas is strangely mesmerizing and Globe was genius) On the niche lines I favor CDG(71,53,Palisander are the ones that I have smelled and liked them all… I am looking forward to smell 3 and 2).. I am about to order some Demeter Fragrance Library bottles (Cannabis Flower,Fig Leaf and Vetiver) and see how this budget/niche thing works out. Uh oh, you just opened a can of worms with that no.1-no.2 ranking of niche fragrances. One cannot ignore the overwhelmingly poor longevity of most L'aritisans. I wouldnt place them in my top 5, let alone top 2. Figuier is certainly unisex, the Figuier Extreme a bit less so, although a man could still wear it. I happen to like Philosykos better than either, but that is just me. Does he wear any fig scents now? It is quite true that they aren't known for lasting power. I have no complaints — even the lighter ones mostly make it through 3 hours on me, and that is ok with me although I know it isn't ok with everyone. What would be your no 1 & 2? I think you're absolutely right in ranking it second, R, since you seem to be taking about cult status and not personal preference. In my experience, L'Artisan is the only niche line besides Serge that you regularly see featured in cheapo glamour magazines in North America. Even my mother asked me: “What's this L'Artisan?” knowing I'd be overjoyed to talk to her about perfume. Sorry, that would be “talking about”. I much prefer the houses MPG, Creed, Caron and YSL (granted only 2 of those houses are niche and its only 4 houses not 5) over L'Artisan. I havent tried Drole De Rose, but I wasnt happy with the patchouli-loaded Voleur De Roses. I dont have any strong positive opinions about the others like Bond no.9, sud Pacifique, Mille harris, Frederic Malle or Penhaligons. Serge Lutens is a house which I have yet to thoroughly explore; so it might yet impress me. Overall, nice review – I wish you and Marlen could resume the “he says – she says” segments since sometimes a male/female fragrance analysis is quite different and interesting. I adore Lipstick Rose with a passion, and find that other fragrances said to be similar do not compare. I was decidedly disappointed with Rose de Rosine, for example. The Malle line is my favorite among the niche lines. SL — love/hate relationship. L'Artisan– mostly like a lot, a few loves, a few hates. Wish they lasted longer. I know we don't do the he says/she says often enough…it is hard to coordinate because I'm always so behind! Right now Marlen is in the process of moving and starting a new job, but hopefully we'll get back on track soon. I adore Malle with a passion, but not Lipstick Rose, particularly. But it is a lovely scent, and nothing that I can think of in the Rosine line has quite the same feeling. I agree with your niche house ranking. I don't have a problem with L'Artisan's lasting power (with a couple of exceptions) so no gripes there. I'm gonna stick my foot in it and say your niche list by definition excludes the great classic perfume houses (Chanel, Guerlain, etc.) Focusing on niche lines, I think L'Artisan deserves the #2 spot both for the number of releases (I've lost count) and the fact that they are, in my opinion, stranger and more creative than any other niche house named in the comments. The fact that they are more immediately accessible in terms of enjoyment, and relatively simple in terms of their “stories,” does not undermine the fact that many of the individual scents are startling — Dzing!, Piment/Poivre, Carotte and Absinthe spring immediately to mind. I always get nervous when people talk about Malle, because my time in the LA Barneys with their weird smelling booths was so limited last year. What am I missing?! I love my PdT, but really need to resmell Vetiver extraordinaire in particular and catch up on Carnal Flower. FM, by the way, wins my award for customer service by a niche line: SAs very knowledgable and website questionaire and samples a great idea. I wear Bois Farine, and I sometimes like it a lot and others it just smells weird to me, I think it is not the typical scent everybody would wear, quite strange…I like all the LÁrtisan line, I think Fou d´absinthe is interesting enough to buy and I´m looking forward to the release of Dzongha…I also like Safran Troublant and Dzing. 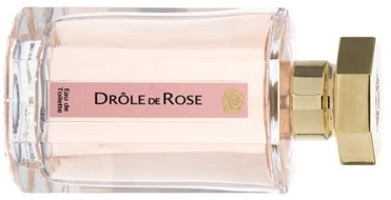 I tried out Drole de Rose one time, thinking that perhaps it might be a slightly more feminine/floral version of my long time favorite, Voleur de Rose. I was so disappointed! The image of a woman in a negligee and powderpuff is so appropriate..lol…but woman is soooo not me…rofl. I felt like I had snuck into my grandmothers closest and spilled her outdated perfume all over myself! Agree with all of that, M. Dzing is a masterpiece, and so is Passage d'Enfer. Agree on the Bois Farine…I love it, but it isn't something I want to wear every day. I do wish L'Artisan still made everything in 15 ml. Safran & Dzing are both wonderful. I did like Fou d'Absinthe, but think Dzongkha will end probably end up being my purchase for this year. It isn't me either, which is why it makes me laugh I guess! But on the wrong day it just feels wrong. Voleur de Rose is a great scent, but I just can't wear it…to much patchouli for me. The customer service is great, but the very limited distribution in the US makes it hard…they'll never get the audience of L'Artisan if they don't expand, IMHO. Vetiver Extraordinaire is one of my very favorites (and the soap is unreal), but I like many from the line. Therese, Hiver, En Passant — all brilliant. R, how did I miss this post yesterday? I guess L'Artisan is up there in the ranking. It certainly can be found everywhere, at least here in LA. I love a few of the fragrances, especially Tubereuse and PdE, but Drole de Rose is so thin compared to Lipstick Rose. It is thin compared to Lipstick Rose, but LR is just too much for me so I prefer the DdR. Neither of them really fits me though, I guess! This is another line of perfumes I am guilty of not knowing too much about. Oh, I can see myself owning far too many bottles soon somehow!………Can I please ask, what is this Dzing! everyone seems to love? I`m sorry I just realised how lazy I was being and I peeked at their website. I can`t believe I`ve never really payed attention to these before! I love the names aswell. Dzing! nearly lost me after the first sentence of the description: “inspired by the circus” I HATE the circus! It gives me the creeps, I don`t know why, but the notes sound really nice so I am looking forward to giving it a try. I also want `Passage d`Enfer` just because I think it is a brilliant name for a perfume! Dzing is an odd fragrance and probably not to everyone's taste, but it is a brilliant composition and worth trying. Passage d'Enfer is one of my favorite incense scents, and yes, a perfect name! He is not wearing any fig scents now…he just eats them!! Aha! You might also look into Marc Jacobs for men (for fig). I find it too much, but many people love it. oh robin, what a beautiful review! well, i did not like most of the SL, but i loved sa majeste, unfortunately ist started good and lasted long on my skin, but smelled after hours like a cheap *** – and i still did not find a rose perfume for myself. though the pasting power of l'artisan ist not much, i think it should be like hat so you can waer different of them during the day. they tell stories, SL is more a one-scent teller, i would never notice a story but a travel in scent. so it depends on how you love perfume – i do not love smells, it is too simple, i love smells telling stories – i love whisky because it smells like “mother earth” and let's you know how strong and powerful and simple earth is and how small we all are. Thank you! I like being able to wear more than one perfume in a day too, so don't mind something that only makes it for 3-4 hours. Less than that, sometimes I'm annoyed though.